Here’s the entrance of the building, in Seattle’s “SODO” neighborhood, at 2401 Utah Avenue South, Seattle, Washington 98134. Starbucks calls their headquarters the “SSC” or the Starbucks Support Center. I took the above picture on my visit to the Starbucks headquarters on Friday, August 12, 2016. I was there trying the new almond milk that was just recently announced in the news (coming to Starbucks stores in September). One thing I can say is that it is nearly unsweetened. Natural milk has a lot more natural sweetness to it. I think a lot of people are going to like it. As I was walking to a conference room to try almond milk, I noticed a large Komodo Dragon (a whole bean Starbucks coffee offering) sign underneath a stairwell. 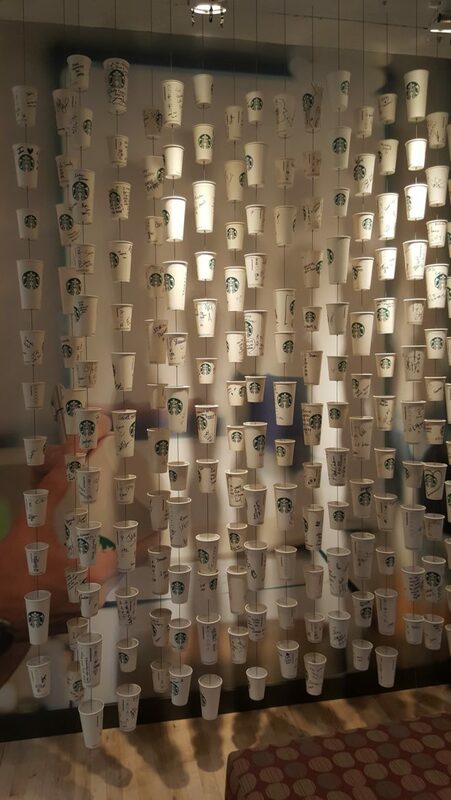 I have been inside the Starbucks headquarters so many times, I have lost count. Each time I always see something new. It is packed with art, artifacts, signage, and so much more. You’ll find beautiful sights high and low. 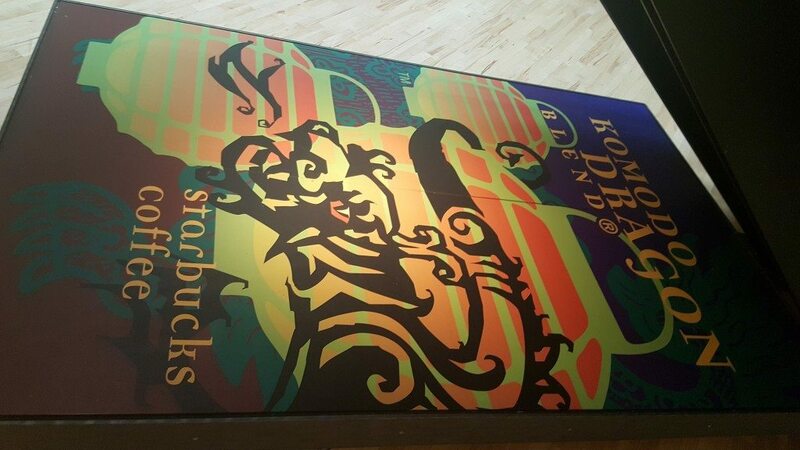 It was this Komodo Dragon art work that inspired me to share my Starbucks headquarters photos with you. There is an area of the Starbucks headquarters that has framed prototype Starbucks cards. Starbucks card collector enthusiasts will enjoy this! 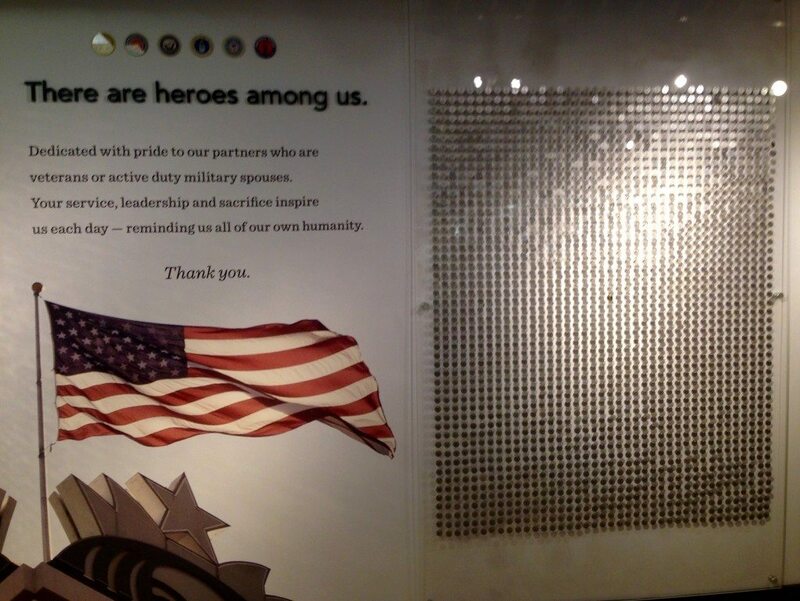 There is also an “Honor Wall” at the Starbucks headquarters. Each time Starbucks hires a person who is a veteran or a military spouse, that person gets their name on a silver, round little disc, honoring them. Starbucks has been in the news that they have a hiring goal of 10,000 veterans (that includes all veterans and military spouses combined). They are more than half way, having hired more than 5,500 military veterans or military spouses. Starbucks defines veteran broadly. It’s anyone who served. So if you signed up and served four years, even if you were lucky enough that it was all peace-time service, you would be considered a military veteran by Starbucks. As far as I am concerned, this is how it should be. If you join the military, it will change your life. And when you sign on the dotted line to enlist, you are signing up for anything that comes your way! I know that goes without saying but I’m passionate about the Starbucks veteran’s hiring initiative. 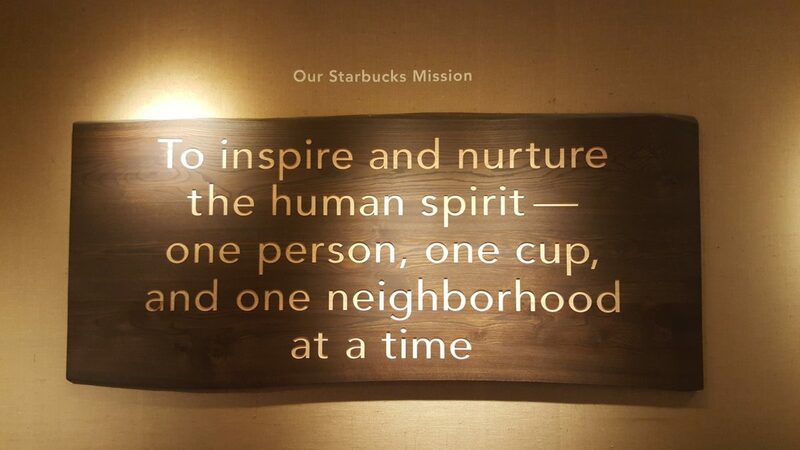 Of course, the heart of Starbucks is coffee! There are places in the Starbucks headquarters where people taste and check the quality of the coffee. 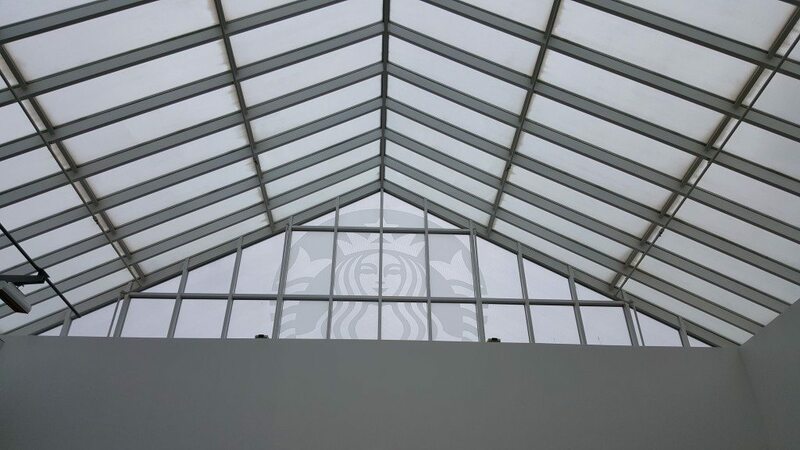 A small group of Starbucks partners work on the 8th floor of the headquarters to constantly check the quality of the coffee, whether it is single origin whole bean coffee or proprietary Starbucks blends. Those partners must drink a lot of coffee! 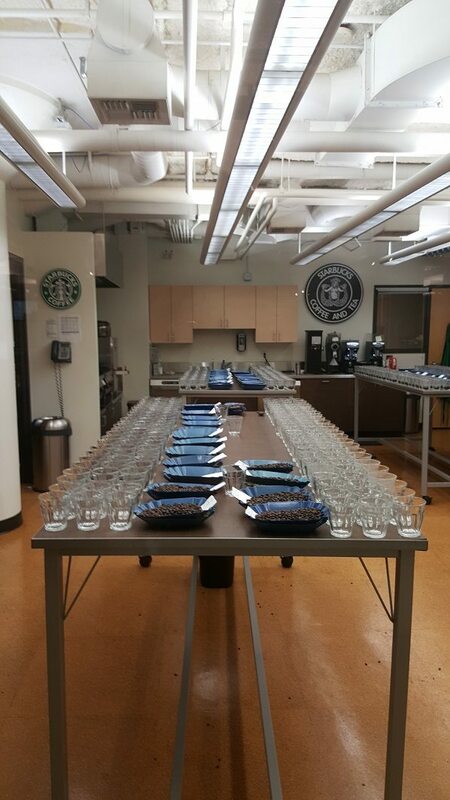 On the 9th floor of the Starbucks headquarters is an area dedicated to coffee education. 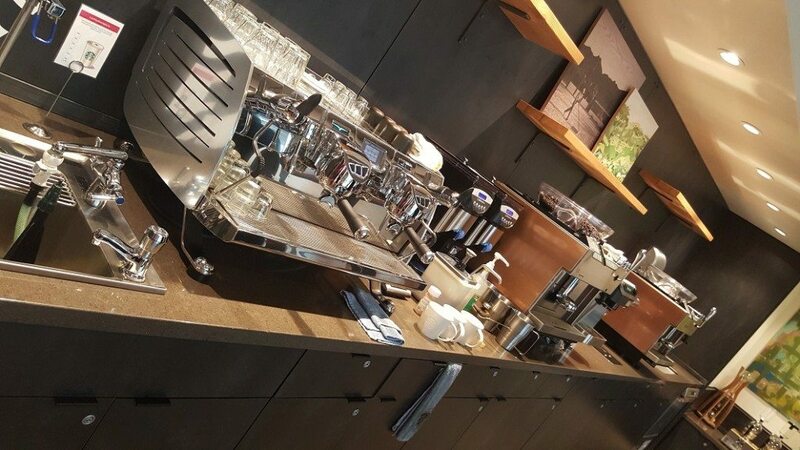 It’s a place where the Starbucks “Coffee Engagement Team” sometimes brings other partners to educate them on coffee, brewing methods, the craft of espresso beverages and more. 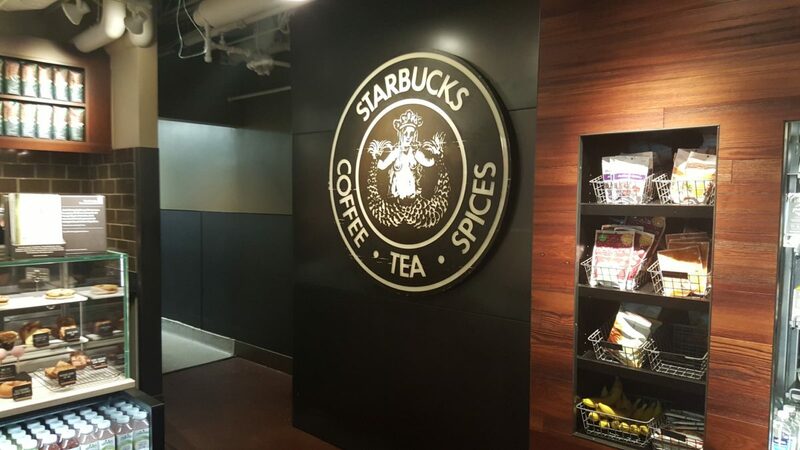 Last but not least, did you know that the Starbucks headquarters has their own special Starbucks inside of it? 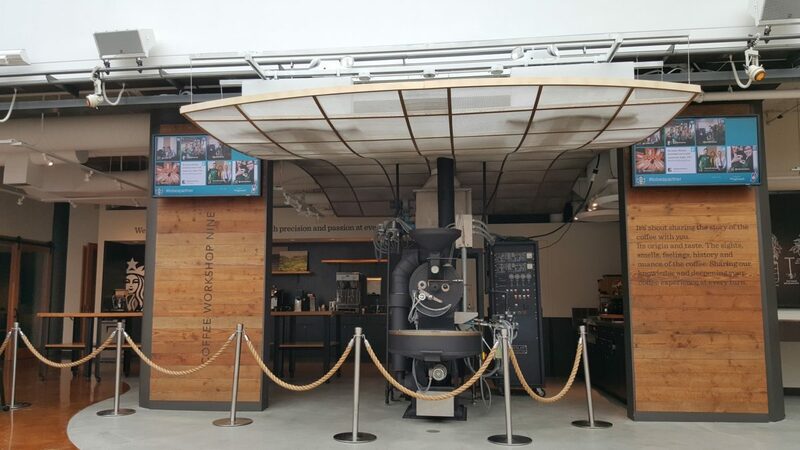 An original Siren from the old Starbucks Airport Way roasting plant hangs inside the “SODO 8” Starbucks. The “SODO 8” Starbucks donates its profits to an organization called the Starbucks Cup Fund, which is a Starbucks non-profit set up to to grant monetary gifts to partners in crisis due to illness, natural disaster, or other tragedy. 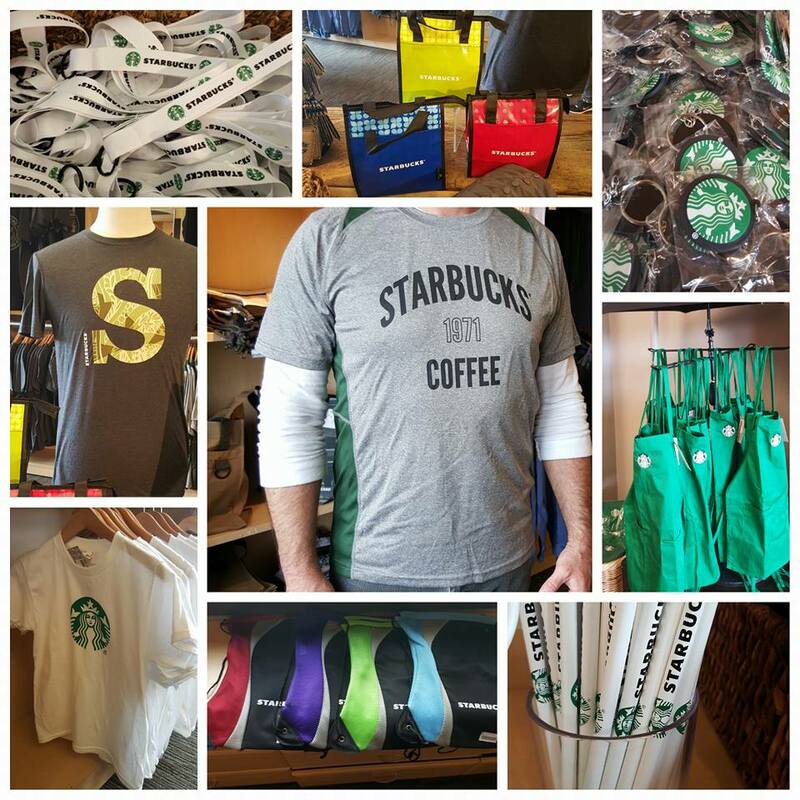 At the Starbucks Support Center, there is a store open to the public which sells unique Starbucks-branded gifts. It’s called the Starbucks Coffee Gear store. Don’t forget to drop by when you’re there! I get asked frequently, ‘How do I get a tour of the Starbucks headquarters?’. There is no system set up to provide customer tours of the headquarters. If you are a store-level partner, you can ask your district manager to help connect you with someone inside for a tour. If you know someone inside already, then that’s great! Reach out to that person. But there is no organized system of providing tours to people. It is a working space with some 4,000 corporate employees inside, all trying to get their work done. Hope you enjoyed your little tour of the Starbucks headquarters. There is a lot more to see! I’ve only scratched the surface. Is it time for Starbucks to change up the mocha? Reserve Iced Dark Chocolate? The Customer Experience: What is really happening in the stores. 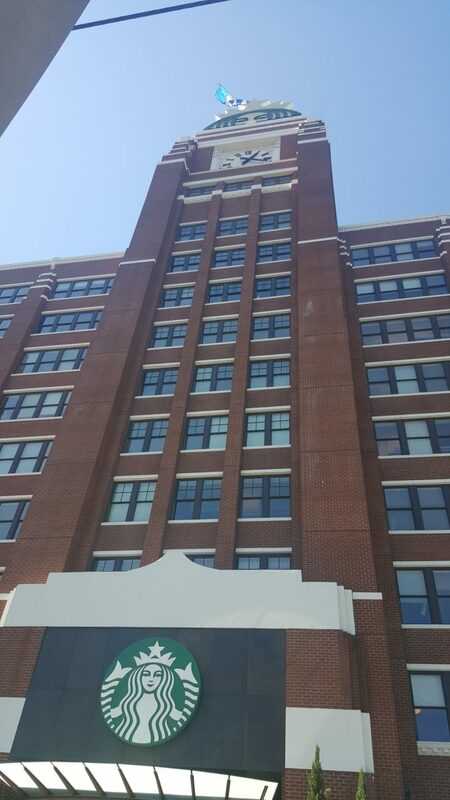 Take a special peek inside the Starbucks headquarters in Seattle. Starbucks Partners: You’re on the Big Screen! Thanks for the tour! There are a lot of places I didn’t get to see when I went a few years ago. Loved this tour! Thank you for sharing it with us! Great photos of the innards of SSC. I was there back in 2015 during a December trip to Seattle. Didn’t get to see too much. Just the 2nd and 8th floor (I believe) and the bottom floor. Very interesting and fun to visit for sure. I am going to Seattle in two weeks! I definitely will go by and check it out. Will they ask questions if I just walk inside?